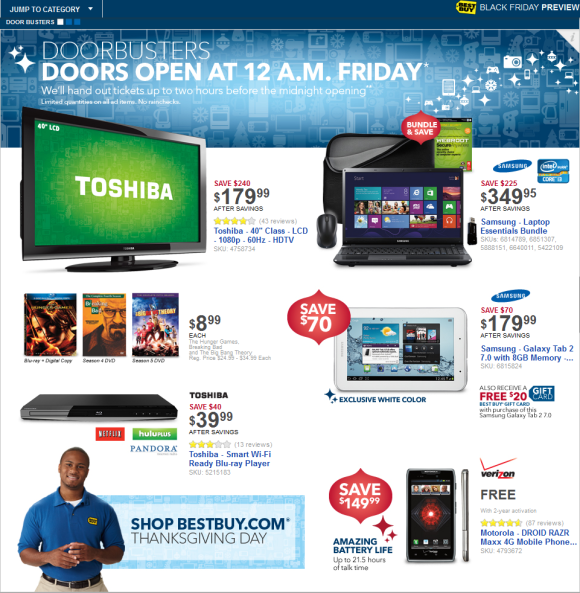 Attention Black Friday shoppers, Best Buy has an online preview of its flyer for the post-Thanksgiving shop fest featuring doorbuster-priced Windows 8 PCs, gaming consoles, DSLRs, and 3D HDTVS. As usual, Best Buy will open its doors at 12:01 a.m. Friday, November 23 and hand out reservation tickets for select doorbuster items up to two hours before the store opens. Shoppers unwilling to brave the cold can also find some online-only deals starting Thanksgiving Day (Thursday, November 22) at BestBuy.com/onlineonly. 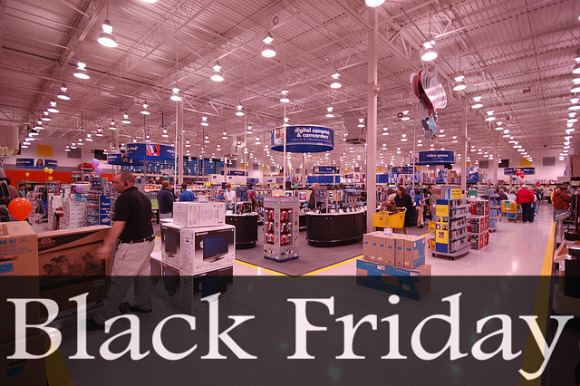 Best Buy's Black Friday preview not only lets you get a jump on planning your shopping strategy, but you can also do a little price checking to see if Best Buy's deals are as good as it claims (spoiler alert: they're usually not). To check your item just look for the SKU number of the product you're interested in and plug that number into the search function on Best Buy's site. You can then find the current price and compare that to Best Buy's Black Friday price. Meanwhile, here's a look at five highlights from Best Buy's upcoming Black Friday sale. Features: 15.6-inch laptop (1366-by-768; 4GB RAM; 500GB HDD; Sandy Bridge Core i3-2370M), laptop sleeve, Logitech wireless optical mouse, 8GB USB 2.0 thumb drive, and 1 yr. of Webroot Internet Security. Features: 14-inch display (1366-by-768), 8GB DDR3 RAM, 1 TB HDD, 2.2 GHz Ivy Bridge Core i7-3632QM processor. Best Buy hasn't listed prices yet for its online deals that start Thanksgiving Day, but some of the items slated for “hot prices” include the Canon EOS Digital Rebel T3 12.2 megapixel DSLR (currently $500), and a Toshiba Satellite 17.3-inch laptop with Windows 8, 4GB RAM and 500GB HDD (currently $400). Best Buy will also be offering more deals on Monday, November 26 for Cyber Monday, the official kick-off of the online holiday shopping season. Features: 1080p resolution and a 60Hz refresh rate.